Are you afraid to send email to your members? Have you ever noticed that you get a spike in cancelations after you send a notice out to your members? I have spoken to many membership marketers who are hesitant to send emails to subscribers for fear that it’ll prompt them to cancel. This is similar logic I used to believe about tennis. When I was 12 years old, learning to play tennis it’d often hit the ball right over the fence. I’d then have to spend the next five minutes chasing the ball across the parking lot to try to find it under some car somewhere. I believed, when I hit the tennis ball, it goes over the fence. I must stop hitting the tennis ball. But with a coach there, she could explain to me what I was doing wrong. She could easily illustrate that a tennis ball could be hit in a way that traveled over the net and remained on the court. And, she showed me how I could do it too. Too much of what membership marketers believe is similar. They don’t send out email because the fear it’ll result in more cancellations. Instead of building a vibrant tribe, they fear reminding their subscriber about them will prompt a cancellation. Don’t live in fear of your members anymore. 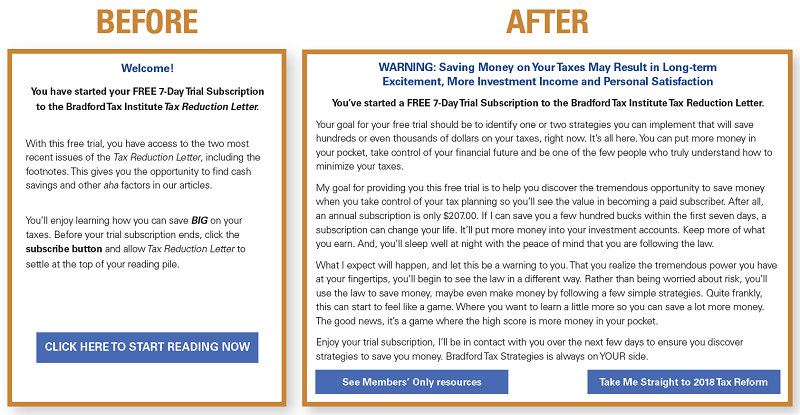 Here’s a before and after of a new member welcome screen and email for a new free trial member for the Bradford Tax Institute. Tax reform is generating a flood of new free trial subscribers, converting more free trials into paid subscription is a huge new revenue opportunity. This welcome screen is the first step in a follow-up sequence designed to increase conversions. In fact, I treat the members as prospects and use the email sequence to help convert free trials into paid subscriptions. In this welcome screen, my goal is to keep the new member excited. Get them engaged in the content and to let them know that my goal of this free trial is to convert them into a paid subscriber. Communicating in an exciting way about what you deliver gets more member more excited after your email than they were before they received your message. If you’d like to see the entire free trial conversion sequence, visit www.BradfordTaxInstitute.com and sign-up for a free trial subscription. You’ll learn about converting free trials into paid subscribers and you may also discover ways to save money on your taxes.